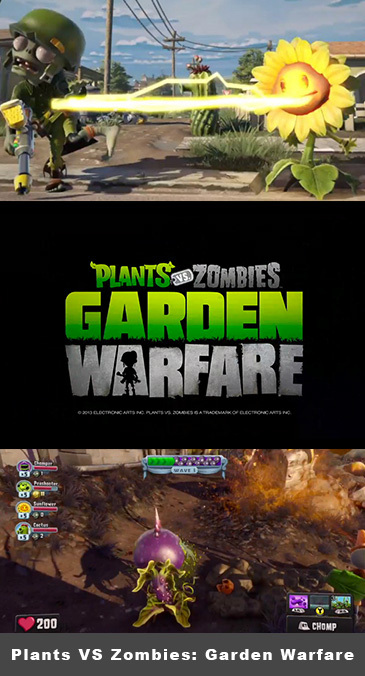 Plants VS Zombies: Garden Warfare - Like CoD? » Plants VS Zombies: Garden Warfare - Like CoD? Plants Vs Zombies is a mobile game that has made quite an impact, kind of like Angry Birds in a way. The team behind it had been dormant for a while, and many were wondering what direction the series would take next. Well, we got our answer at E3, and let's just say that the result is surprising, and far from disappointing at the same time. Really, Plants Vs Zombies is a great game series that just could've gone any way for their next version, but for its arrival on next-gen platforms, the team behind it decided to go for a third person action title, and actually one that resembles the style of the famous Call of Duty! The name of the game is Plants Vs Zombies: Garden Warfare, and it is one where pretty graphics, action and humor all mix in together. Multiplayer and cooperative play will also play a big role in this new title. But what does it look like? Well, imagine a third person Call of Duty, except with plants, zombies, flashy environments, gigantic bosses and a ton of humor! Let's just say that for the people who claimed that the action shooting genre had gotten predictable, seeing Garden Warfare with its garlic drones will make them change their mind pretty fast! The game carries with it a style that’s resembles nothing we’ve seen so far in this genre. The mix of humor and epic cooperative teamplay could be just what players need for the new console generation. It could also be the title that gathers the whole family in front of the TV. Indeed, the difference is striking as soon as you see this game with plants using their crosshairs to shoot zombies. So far, people pretty much all agree that this game looks amazing. It has great glossy graphics, the plants and the environments look stunning. The game uses the same theme as the mobile game, but makes it blown off in full impressive 3D. Each plant has its own class and abilities: there's the peashooter, an on-ground infantry kind of class, the chomper, a melee fighter that takes quite some practice but that's very rewarding, the cactus, great at picking up zombies from a distance, and the sunflower that will apparently be a healing class. These classes and abilities will bring quite some variety to the action. For example, you could be able to dig into the ground or eat your enemy in combat. So, this won’t only be a CoD with plants and zombies skins. There's also the presence of bosses to be outlined, which are gigantic and seem to be a ton of fun to battle as a team. There's no doubt that the different classes of the plants will come in handy to bring these monsters to the ground. The E3 demo, which kicked off at EA’s conference, showed off a boss which kept getting bigger, finally stomping the player at the end. It looked simply epic. This demo reminded a lot of the Call of Duty series, and the comedy effect of these plants and zombies imitating some of the elements of the recent best-selling franchise commanded an instant feeling of hilarity. Fans shouldn’t have to worry because the humor seems to be totally on-point in Garden Warfare, if not more present than it’s ever been. The characters are extremely lovable on-screen and their seriousness in their mission is totally charming. In this interview, Tony Leamer, Franchise Business Director at PopCap, states that Garden Warfare will be an accessible, but still deep game, which is very good news. He also goes on to explain the interesting process and debate that went on before risking the series in a new direction with a third-person shooter. In conclusion, Plants vs Zombies 2 is one of the most interesting developing game stories heading into the next generation. The demo was very impressive, especially considering how this development team seem to have little backgrounds for games like this. Plants vs Zombies: Garden Warfare is scheduled for Spring 2014 on Xbox One, then Xbox 360, and other platforms will also be coming up. There’s also some interactivity planned with the mobile Plants vs Zombies 2. The Plants vs Zombies: Garden Warfare concept has developed through a few twists and turns as it was now announced that the title would be multiplayer only. This deal also comes with a lower price tag of $40 on next-generation consoles. Garden Warfare will be available for purchase on both shelves and online stores. This focus on multiplayer might disappoint a few people who would’ve liked to go through a full campaign with these characters, but these efforts should produce some excellent online play. Then, a trailer was revealed at Gamescom, which focuses on the zombie side. You can slow it down to read all the zombie classes, abilities and weapons. Amongst the classes shown in the trailer there's Soldier with standard army gear, All-Star with a huge machine gun, Engineer with many tools at his disposal, and Scientist who can teleport. We also get to witness some more of the plants' abilities in between each of the zombies featured. Also announced is the ability to customize the look of your zombie. Another trailer was released around the same time to reveal “Boss Mode”. With gestures and voice commands through a mobile device, you can drop “Zombombs” on the battlefield wherever you are, which sounds similar to what The Division will be offering. The trailer features humor and great voice acting as usual. Stay tuned for more info on this strongly hyped game! PopCap certainly doesn’t seem to be short on ideas for this one, and we should once again get a very original game from them. Electronic Arts has released this trailer for the PlayStation 4 version of the game. Check it out! Electronic Arts has revealed that PlayStation 4 owners will get a nice set of bonuses when they preorder a copy of the game. In addition to two digital card packs, you'll receive PlayStation exclusive customization options including hats based off the Ratchet & Clank, Fat Princess and Sly Cooper series! Electronic Arts has revealed that Plants Vs Zombies: Garden Warfare will be hitting the PS4 on August 19th in the United States and August 21st in Europe. The game will run in 1080p at 60 frames per second and include some PlayStation exclusive items. I'd love to see this on PS4. Me too. Really would buy it, prolly on launch day.